89.9cm, (35") x 88.9cm, (35") x 88.9cm, (35"). 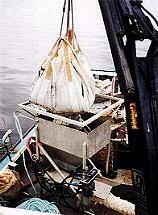 Transporting mussel seed and transfering the seed to socking tables. For maximum seed freshness and reduced labour handling costs, bags are custom made and fit conveniently inside insulated fish boxes, controllable bottom outlet spout for ease of product dispensing.